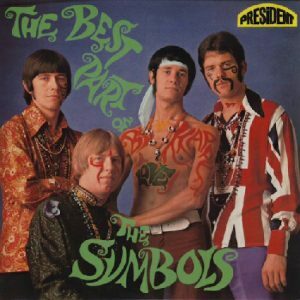 A harmony pop band with origins in the pre beat-boom era of early 1960’s Britain, the re-named Symbols emerged in 1965 with a reputation as one of the best live draws in the south east. With near-constant gigging and a knack for incorporating the catchiest of US hits within their set, The Symbols caught the attention of the newly formed President Records label. Label owner Ed Kassner was looking for a band to cover a US smash hit ‘See You In September’ in 1966 (the song being published by Kassner Music). The group, with original line up – John Milton (vocals), Mick Clarke (bass guitar), Shaun Corrigan (lead guitar) and Clive Graham (drums), were duly signed. The Symbols fourth single for President was a version of the Four Seasons earlier US hit, ‘Bye Bye Baby’ and it made the UK charts in 1967 , with a suggestion that in so doing it inadvertently laid down the blueprint for what would become the Bay City Rollers’ No.1 some eight years later. A second hit with ‘(The Best Part Of) Breaking Up’ in 1968 heralded their only LP release, The Best Part Of The Symbols. In all there were seven singles for President and these plus the LP were collected together in 2004 for a comprehensive CD reissue, The Best Part Of The President Years 1966-1968 including previously unreleased material. One of the unreleased recordings unearthed for the CD was The Symbols original demo of ‘Silence Is Golden’. A regular song in The Symbols live set of 1966 it was introduced by Mick Clarke to The Tremeloes when he joined them that year. Clarke was briefly replaced by Adrian Gurvitz on bass , the latter going on to become a founder of the group The Gun and major songwriter. Clarke returned to The Symbols then later joined The Rubettes in 1973.